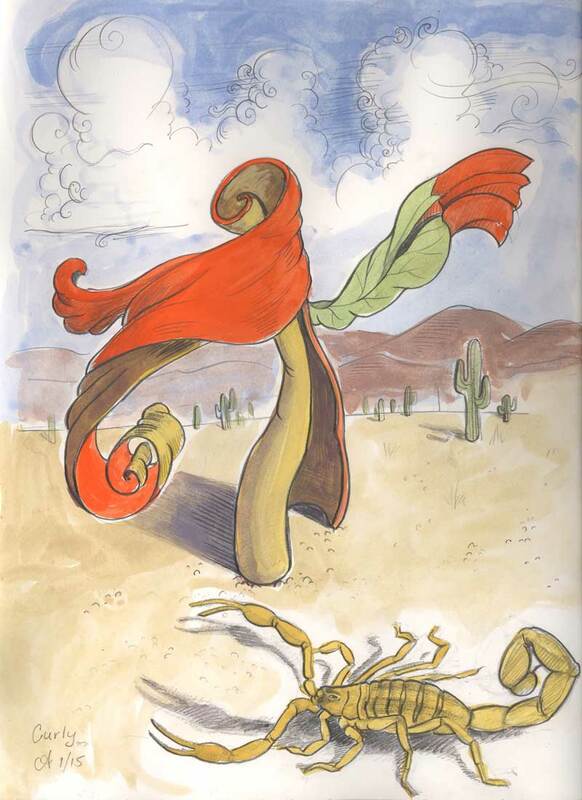 Have a wonderfully neoclassical, post-surrealist Valentine’s Day! (I’ll have a box of dark chocolates with this, please, if anyone is listening). 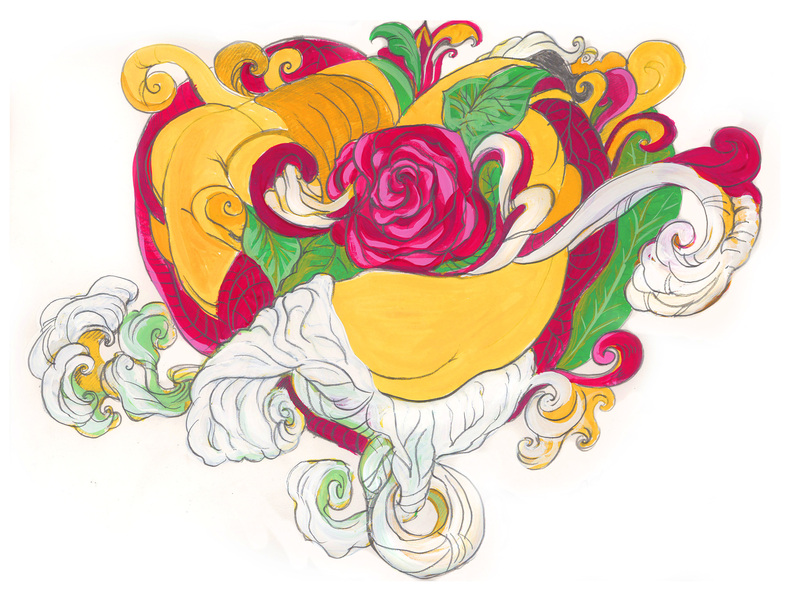 Neoclassical, post-surrealist valentine doodle. Or something like that. Pencil and gouache on paper, ©2015 Wendy Aldwyn. Curly was the meanest, rootenest, tootenest, doodle in the West, pictured here with his trusty sidekick, Butch the Scorpion. Curly pulled off many a sting with Butch, charmed the ladies, rode many a mile together in the dusty desert. Curly never uncurled to show what he looked like on the inside. Some say he hid a sentimental inscription by his dear, departed mother. Some others say he hid a nasty scar. Whatever the reason, as rough and tough as was his reputation, he was always quick to kindly joke a child’s tears into laughter, or help a little old lady across the street. Dedicated to my friends and family in the Southwest. When conversation lags with family on holiday get-togethers, it’s always good to bring out the word board games. Lately, we’ve been playing a lot of UpWords®, an old board game which is a 3D relative of Scrabble (I’m actually surprised when I run into people that don’t know what it is). Basically, after several minutes of playing, you can see towers of letters forming in areas, in contrast to flatter areas, so you can sort of get the effect of a downtown and suburbs with words. Today’s Christmas doodle was generated during a typical recent UpWords game in our house, in which participants take great care and much time in choosing just the right word or combination of words to gain points. Many times we think up words which are perfectly good words, but they just have not yet been assigned a meaning in the English language, so unfortunately we can’t use them. 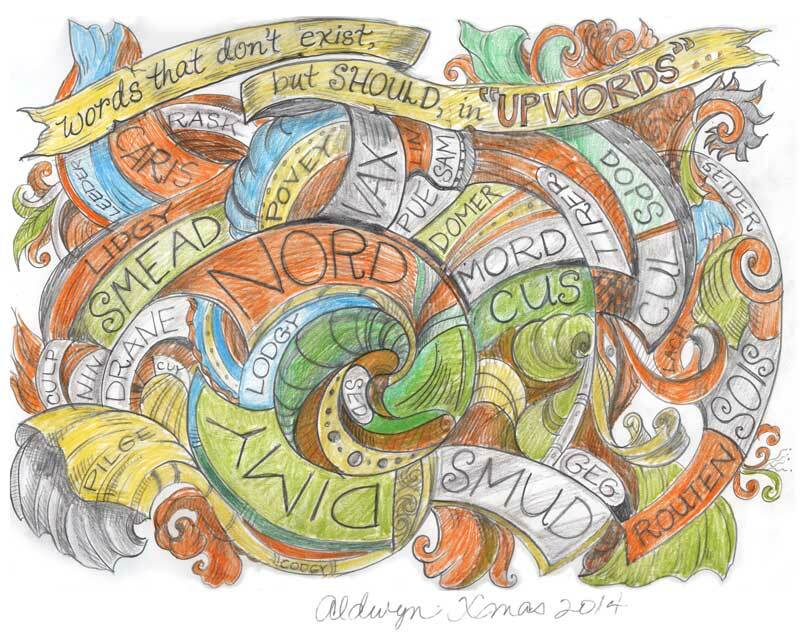 This doodle is dedicated to those words which have not yet been born. Merry Christmas, y’all! Words that don’t exist, but should, in UpWords. Guilty. I admit it. 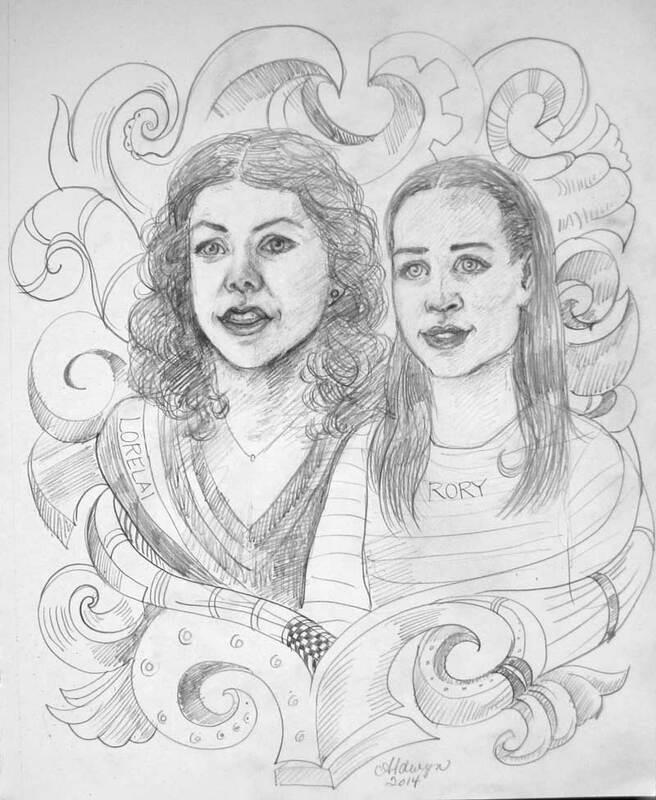 I just love the Gilmore Girls. And because I like drawing moving targets, I doodled this while binge-watching the show over the weekend. I actually drew this on on nice paper for a change, other than my usual lined notebook paper, ripped open envelope or back side of flowery stationary. I drew this upside-down from what is shown, but it looks better in this 180 degree rotation. Tuesday is Doodle Day. 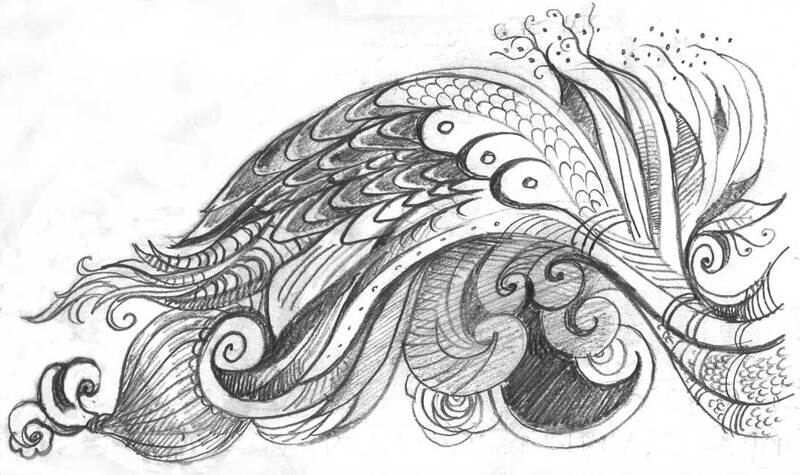 Give flight to your fancy with a feather doodle. 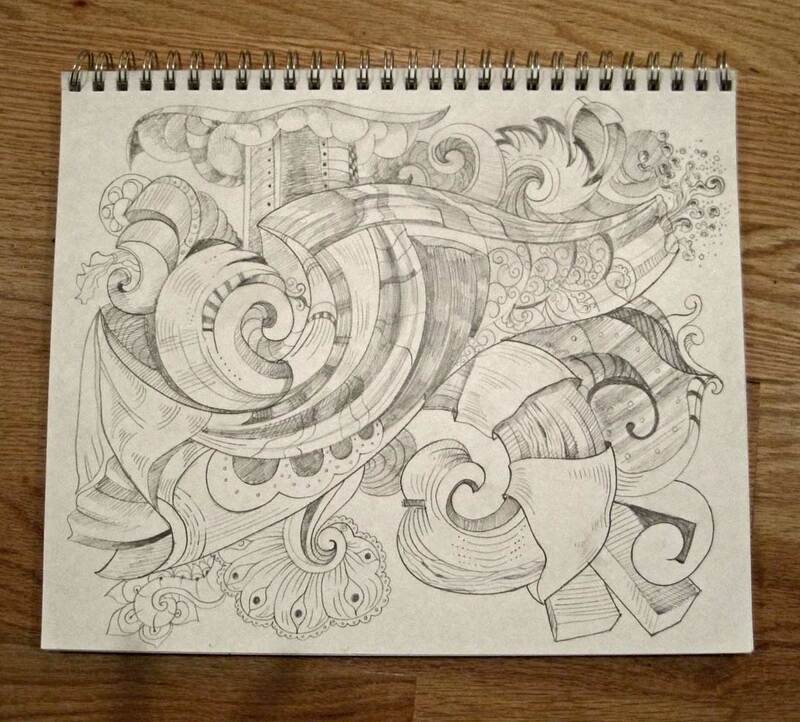 The best doodles are idly performed, without forethought or sense of purpose or meaning. 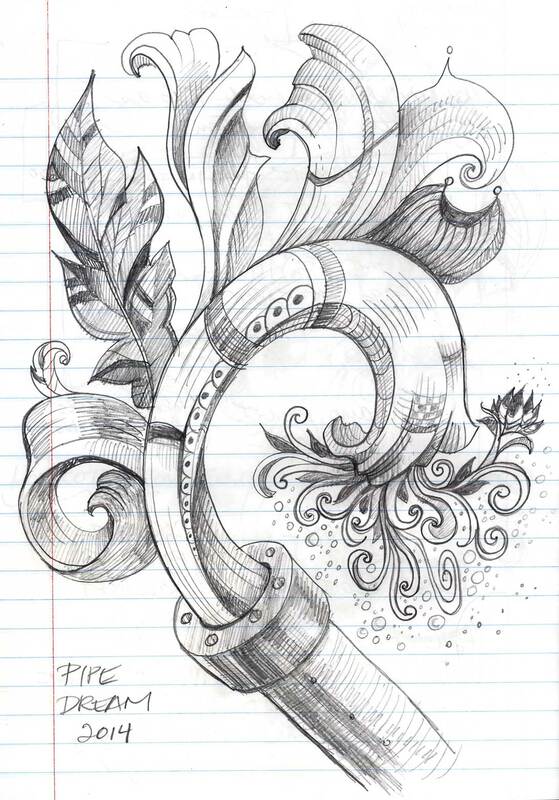 But after a doodle is “done”, that is, when you’ve put the drawing tool down and moved on to more lucrative pursuits, the doodle might take on a meaning of it’s own. 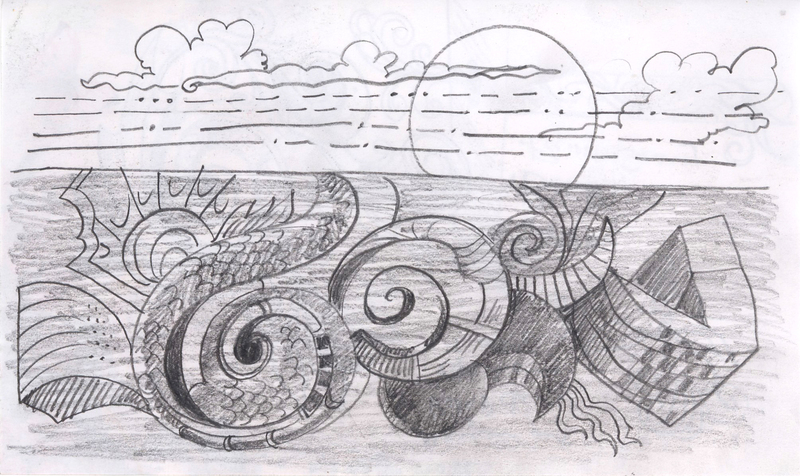 So, just curious, does today’s doodle communicate anything to you?